What is a universal wedding registry? We get this question a lot. In a nutshell, it's the easiest way for you to organize your wedding gifts from different stores all in one place. A traditional registry limits you to one store or at most a few physical stores (you don't want to seem greedy). By using an online universal registry like Birdbell, you can register for anything you can buy online. Love something handcrafted and unique. No problem! Want dinner plates from one place and salad plates from another? Done! The sky is the limit. You no longer have to run around the store looking for things to put on your list or drive all over town so guests have a variety of gift options to choose from. You can choose 10 things from a store, or just one. Your wedding registry can be created from the comfort of your couch while you binge watch Say Yes to the Dress. Not only is a universal wedding registry great for you as a couple, your guests will appreciate it as well. Sure grandma might want to shop in the store, but she is probably the only one. Everyone is busy nowadays so who has the time to hop from store to store? On a recent trip to PotteryBarn, I witnessed a poor woman searching the multitudes of displays desperately looking for 2 missing wine glasses from a matching set. The store inventory system said they were in the store, but no one could find them. Her friends were growing impatient and you could tell this woman was tired, frustrated, and just wanted to buy the darn wine glasses and get on with her day. With Birdbell, she could have purchased the items online and had them shipped directly to the wedding couple. No need to lug a big box of breakable items with you to the wedding either. Instead of frantically searching the store, her day with friends could have been filled with more fun things, like drinking wine, enjoying a nice lunch, and hitting up sales. Plus, your friends and family want to buy you the things you really want; not something you just put on a list because it was the best option at Nordstrom, Target, or Williams Sonoma. And if grandma really does want to go to the store, she can still purchase the item on your registry at the store as long as you have gifts from a store with a physical location on your Birdbell registry, which is completely possible. Why not just register at one store and be done? Think about it. Have you ever walked into someone's home that bought the whole matching furniture package; you know..the couch, loveseat, end tables, coffee table, lamps, and rug from the display at the same store. Remember how it looked sterile and too matchy-matchy? Packages like this look great in the store because there are other collections and furniture pieces too. But, when you try to bring the store home in one piece it just doesn't work. Comfortable homes are ones that feel lived in, crafted together over a lifetime of memories and experiences. This is what shopping all over the web with your specific tastes in mind can bring to your home. It's now possible to include that accessory you've been drooling over from that small handcrafted shop on the other side of the country on your wedding registry. And better yet, it's as easy as adding something from Amazon to your list. But, I wanted to use the scanner gun to shop. Great! 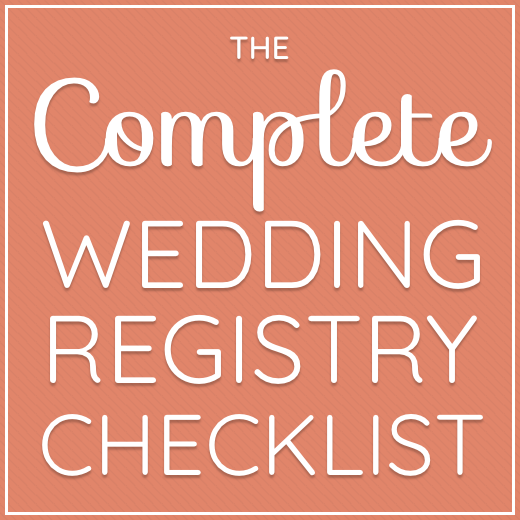 If you really want to shop in the physical store for your wedding registry you can. Once your list is complete and you are finished shopping, you can enter your wedding registry link on Birdbell to import your list. We will locate the items online at your chosen store and include them on your universal list. Did you know guests can also sort the items on your universal registry by store and price so they'll be able to know who they are purchasing the item from as well if that is important to them? My significant other and I do not have time to shop or it's not really our thing. We get it! Weddings are stressful to plan and there are so many things on your to-do list already. If shopping's not your thing, then creating your registry can be something you dread. Who wants to do something they dread? No one and especially not when you are planning one of the best days of your life. You've come to the right place. Birdbell can help with our curated wedding registries. We love finding the perfect items for couples everyday so we've created hand selected wedding registries to fit your lifestyle. From dishware and dining to linens and entertainment, we'll add things to your registry for you. Don't worry, you'll be able to edit, add, and delete if you want something else. Ready to get started? We'll guide you through the process effortlessly and in no time, you'll have one more thing checked off your list and be even closer to your happily ever after. You can start creating your wedding registry here or take our quiz to start with one of our curated registries.